Since 1954, a discrete and select group of wealthy and powerful individuals have attended a private, yearly conference to discuss matters of their choosing. This group represents European and North American elites, as well as new talent and rising stars, from the worlds of politics, business, media, academia, the military and even royalty, and has included household names such as Margaret Thatcher, Henry Kissinger and even Prince Philip. In recent years their number have featured David Cameron, Tony Blair, Angela Merkel, Bill Clinton and David Rockefeller. These are ‘the Bilderbergers’, named after the hotel where their secret gatherings were first hosted. What is their purpose, why do they meet, and what do they want? Investigative writer Gerhard Wisnewski explores the numerous claims of conspiracy that swirl around the group, revealing names of participants, their agendas and their goals. The scene opens in the sun-kissed seaside resort of Vouliagmeni, Greece, where Wisnewski attempts to observe and report on a Bilderberg conference. He soon attracts aggressive attention from police and undercover security, and it is made abundantly clear he is not welcome. From this rude introduction, Wisnewski works backwards to the founding of the Bilderbergers in 1954 by a shadowy Jesuit with secret service allegiances. Examining records and hidden reports, Wisnewski uncovers the true history of the organization, the alliances among key individuals and their common interests. Are the Bilderbergers puppet-masters, pulling strings behind the scenes? Are plans afoot to create a global government and a new political system? To what extent do they represent a clandestine super-government? 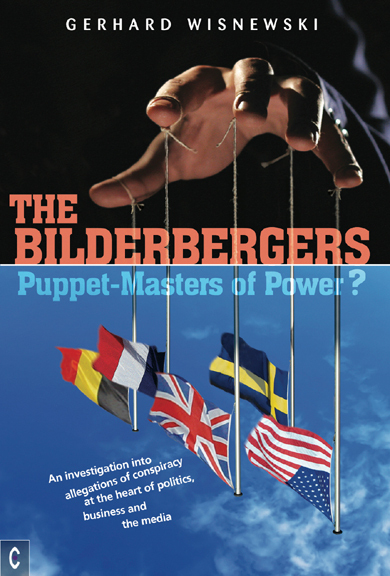 This book offers a unique view into the workings of power, and the secret methods of those who seek to govern and control behind the scenes. Watch youtube video - The Secrets of the Bilderbergers. GERHARD WISNEWSKI was born in 1959. He studied political science, and since 1986 has worked as an author and documentary filmmaker. The author of One Small Step? : The Great Moon Hoax and the Race to Dominate Earth from Space, his other bestselling books (in German) include Das RAF-Phantom (‘The RAF Phantom’), Operation 9/11 , Mythos 9/11 and Verschluss-Sache Terror (‘The secret files of terror’). The film Das Phantom, based on his book, was awarded the Grimm Prize in 2000.